The First Alert 5 lb. 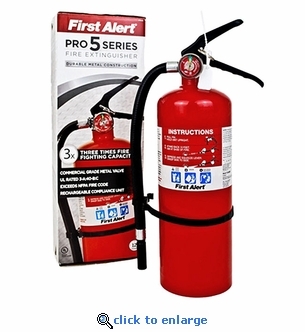 Pro Fire Extinguisher exceeds NFPA fire codes with a UL rating of 3-A:40-B:C to fight common household type A fires, plus live electrical equipment and flammable liquid fires. This portable and rechargeable fire extinguisher includes a heavy duty wall mount hook and is suitable for homes, offices, garages and workshops. Heavy duty steel construction makes it an ideal fire extinguisher for commercial and industrial use. This fire extinguisher ships charged and ready to use. 1. Break seal and pull out safety pin. 2. Aim nozzle at base of fire. 3. Press and hold lever to discharge extinguishing agent. Class A: Wood, paper, plastic, fabric, building materials, etc. Class B: Flammable liquids, grease, oil, gas, solvents, etc. Class C: Electrical Fires: Appliances, electronic equipment, etc.